RALEIGH — In a ceremony on Thursday, August 31, the Supreme Court of North Carolina honored the African-American justices who have served on the state’s highest court. 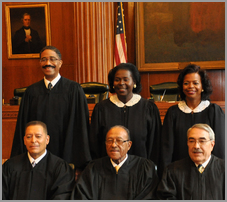 (pictured from left to right, front row): former Justice James A. Wynn Jr., former Chief Justice Henry E. Frye, former Justice G.K. Butterfield, (back row) Justice Michael Morgan, former Justice Patricia Timmons-Goodson, and Justice Cheri Beasley. The event featured a portrait sitting of the six justices and a short program honoring (pictured from left to right, front row): former Justice James A. Wynn Jr., former Chief Justice Henry E. Frye, former Justice G.K. Butterfield, (back row) Justice Michael Morgan, former Justice Patricia Timmons-Goodson, and Justice Cheri Beasley. The historic celebration included remarks by Court of Appeals Judge Wanda Bryant, Chief Justice Martin, Gov. Roy Cooper, former Gov. Jim Hunt, Michael Easley Jr., former Gov. Beverly Perdue, Senator Dan Blue, former Justice Butterfield, former Justice Timmons-Goodson, and former Chief Justice Frye. Dignitaries from all three branches of government were in attendance, including current and former members of the Supreme Court and Court of Appeals, judges, and judicial staff. Chief Justice Frye was the first African-American to serve on the Supreme Court as associate justice from 1983 to 1999, and the state’s first African-American Chief Justice from 1999 to 2000. He also was the first African-American assistant U.S. Attorney for the Middle District of N.C. in 1963, and the first African-American in the 20th century to be elected to the N.C. House of Representatives in 1969. Former Justice James A. Wynn Jr.
Justice Wynn currently serves as a judge on the U.S. Court of Appeals, Fourth Circuit, since 2010. He served on the Supreme Court in 1998 in between serving on the N.C. Court of Appeals from 1990 to 1998 and from 1999 to 2010. Justice Butterfield is serving in the U.S. House of Representatives, First Congressional District of N.C., since 2004. He served the N.C. judiciary for 15 years, including as a Superior Court judge from 1988 to 2001 before joining the Supreme Court. Justice Timmons-Goodson was the first African-American female to serve the state’s highest court. She currently serves as Vice Chair, U.S. Commission on Civil Rights. During her 28-year tenure on the bench, she also served on the N.C. Court of Appeals from 1997 to 2005, and as a District Court judge in Judicial District 12 from 1984 to 1997. Justice Beasley is the second African-American female to serve on the Supreme Court. She also served on the N.C. Court of Appeals from 2009 to 2012, as a District Court judge in Cumberland County from 1999 to 2008, and as an assistant public defender for five years. Justice Morgan is the 99th and most recent justice of the Supreme Court. He has served as a judge for more than 27 years spanning three different judgeships, including five years as an administrative law judge, as District Court judge in Wake County from 1994 to 2004, and as Superior Court judge from 2005 to 2016. The Supreme Court of North Carolina is the state’s highest court and there is no further appeal from its decisions on matters of state law. It comprises the Chief Justice, who also serves as the head of the Judicial Branch, and six associate justices, each serving eight-year terms. The Supreme Court will celebrate its 200th anniversary in 2019. The Judicial Branch is an equal and distinctively separate branch and core function of government. More than 6,000 Judicial Branch employees statewide administer justice in courthouses in North Carolina’s 100 counties. The Judicial Branch budget for FY 2016 – 2017 is $516.6M, 92% of which is used to pay salaries and the remaining 8% is used for operations. The Judicial Branch receives 2.29% only of the overall State budget. More than 47% of the Judicial Branch’s appropriation is equivalent to revenues collected by the courts through imposed fines and fees that are deposited in the State General Fund. The N.C. Administrative Office of the Courts (NCAOC) is the administrative agency for the N.C. Judicial Branch, providing administrative services to help the North Carolina court system operate more efficiently and effectively, taking into account each courthouse’s diverse needs, caseloads, and available resources.